We sometimes find ourselves at a fork in the road, and now is such a time. We have all survived, for better or worse, the steep collapse in stocks and the steep (if partial) recovery thereof. The bond markets are back to near-normality and the recession/ housing/jobs free-fall has steadied just a bit. We have regained a tentative measure of stable footing. Now what ? Disruptions and shocks of the magnitude of the past 18 months do not and cannot end with a slow fade of the music and with everyone finding a chair. Who is going to be without a chair, and what kind of chair will be missing? The balance sheet of the Federal Reserve Bank has expanded by more than twofold since August 2008. Our core investment philosophy is one of tactical allocation — meaning that we attempt to identify asset classes that are materially above or below our estimates of fair value. Fair value is, admittedly, often in the eye of the beholder, and there are some asset classes for which it is rather difficult to divine an objective estimate of fair value. Still, the major asset classes are not that difficult to figure out. Since the bottom in early March, stocks have risen over 50%. It’s not the size of that rise that concerns us, it’s the simple fact that stocks are now fully priced for a complete economic recovery. At about 20 times the long-term inflation-adjusted earnings trendline, the S&P 500 is about as rich as we like to see it. We see no need to accelerate stock purchases at this time. We are averaging new client cash into stocks, rather than fully investing it all right away. The bond market split into two last year — government bonds and everything else. The “everything else” market is right around our estimate of fair value; government bonds are quite overvalued in our opinion and offer unacceptably low yields. While we think that high-yield corporate bonds are priced fairly, we reduced our positions from overweight to neutral at the end of Q3, taking some of our profits from positions purchased in late 2008 and early 2009. REITs have made a huge rally, despite the strong evidence of continued deterioration in the commercial property market. We’re not biting on that bait. Along with the bubbly pricing of government bonds comes a bubbly treatment of the dollar. For reasons discussed in the main article, we have increased exposure to a basket of foreign-denominated stocks, bonds and commodities. As the recession and markets have settled down, most major asset classes have moved into fair value territory. Accordingly, we are being cautious in all of our allocation weightings. Where did the Fed get its hands on the money to buy all of these assets – meaning the liabilities to match up to the assets? 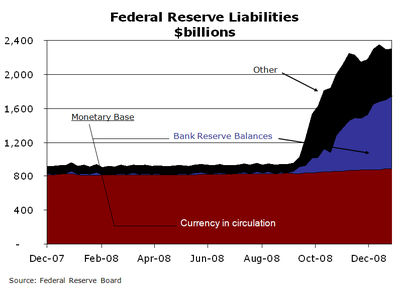 In normal times, nearly 90% of the Fed’s liabilities consist of currency in circulation. Pull a dollar out of your pocket. It says “Federal Reserve Note” across the top. A note is a liability, or promise to pay, of the issuing entity. What does the Fed promise you? Only that the government promises to accept dollars from you when you pay your taxes, and that your domestic compatriots are required by law to accept dollars in payment for goods and services. So, did the Fed issue $1.3 trillion in new currency in the past 14 months to pay for all these new assets? Heck no – that uses up too many trees (and would trigger inflation). Instead, the Fed took out a little pencil and wrote the equivalent dollar amount on the liability side of its balance sheet, showing a deposit into some banks’ accounts – such as Bank of America or Wells Fargo. The Fed “deposited” into the reserve accounts of banks enough “money” to increase those accounts from $12 billion in October 2007 to over $950 billion today (read that again if you did it too fast). While that’s not a gift to those banks, it is cash the banks didn’t have before (before, the cash was locked up in lousy mortgage bonds; those bonds are now owned by the Fed and the banks have newly minted cash in exchange). Banks can now ask the Fed to hand over their reserve account balances whenever they want the cash – and the Fed can’t say, “No,” anymore than your bank can say, “No,” when you want your money back. Except – the Fed doesn’t want banks to withdraw $900+ billion in new balances. That equals the entire global supply of currency before the crisis started!. Such a huge cash withdrawal can trigger rapid inflation – too much paper money floating around, created via new loans (see accompanying article, Fractional Banking System). Historically, the Fed paid zero interest on the banks’ reserve balances. Nowadays, the Fed pays interest on balances and banks leave their excess cash at the Fed, rather than lend it out to customers. Mr. Bernanke has written that, by manipulating this interest rate offered to banks, he can induce them to take less of their money out of the Fed and bring us all in for a nice soft landing. After all, economic theory says so. Forgive me for not having blind faith in economic theory. Down one fork in the road, the economy begins to recover and business activity builds up a head of steam. Banks would then find better uses for their money, draw on their Fed reserves and turn those reserve balances into currency. If this happens too quickly and drives up prices, the Fed can and will raise various interest rates by various means. At the same time, the Treasury is still selling trillions of dollars in debt, which puts further upward pressure on rates. There is one and only one sure cure for inflation and a deteriorating currency: High interest rates. There is another fork in the road – what we call the “wet blanket recovery.” Economic activity stabilizes and perhaps improves a bit, but it just doesn’t get cranked up to the growth rates of the bubble years (i.e., 1997-2006). Every time things start picking up, interest rates rise and the green shoots of growth wither once again. We face two unattractive outcomes. And those two outcomes have rather differing investment implications. If the economy recovers rapidly, higher interest rates will be deadly for long-dated bonds and, in the near term, for stocks and real estate. Even inflationprotected bonds can suffer in such an environment. This outcome would favor short-term government and corporate bonds, natural resource stocks, and little else. If the economy instead sputters along (like a wet blanket over a fire), we expect that rates, and inflation, will stay low. The implications of this outcome are better for long -dated bonds, but not so good for the dollar. This could produce a long-lived inflationary grind rather than a short -term spike. This environment would favor allocations to high-grade bonds, dividend-paying and energy stocks, and a significant commitment to foreign-denominated flavors of high-grade investments. We do not know which fork the economy will choose. We do, however, have more confidence that the “wet blanket” recovery will come to pass, rather than a sharp recovery accompanied by harsh inflation. Our tactical approach is to emphasize those investments that provide us profits and safety under either outcome. While the profit potential is greater if one chooses a single road, making a big bet on that one outcome, our clients have given us a firm mandate to both seek profits and manage downside risk. Thus, we are implementing a weighted mix of the two strategies. We are continuing our underweighting to core largecap stocks. At the end of Q3, we rebalanced our holdings of both stocks and bonds to move more of those holdings into non-dollar denominations. We have shortened the average maturity of our bond holdings and improved the overall credit quality by reducing corporate and high-yield positions. We continue our overweight to energy and natural resources. We own no REITs or emerging market stocks at this time. We believe that these tactical positions will provide our clients with the ability to participate in an improving economy, while not leaving them highly exposed to the potential blowback of high interest rates and inflation that could accompany a rapid shrinking of the Fed’s balance sheet. After being in this business for almost two decades it still amazes me how people can rationalize away common sense. You would think after the last two years of insanity on Wall Street that the almighty black box and quantitative models would have incorporated that variable called common sense. The latest irrationality has reared its head in many areas, but one sector really has me baffled. During the normal course of business we examine all the different parts of the market and during this routine examination, I was reviewing performance and discovered that the (VNQ) Vanguard Real Estate ETF (ETF stands for Exchange Traded Fund, basically a mutual fund that trades all day long as opposed to one that you only buy at the closing price) was up 19.22% through 9/30/09. On top of that great performance you can still get a dividend yield close to 7%. I thought, wow that seems unusual based on the information we are hearing from landlords and investors here inCalifornia. I decided to look under the hood of the Vanguard ETF to see what I was missing. The holdings are Real Investment Trusts from all over the country. Simon Property Group (SPG) is the top holding. They run shopping malls around the country under the “Mills” brand. So, I decided to look at Simon Property Group’s SEC filings and see what amazing properties they own which must be bucking all the trends out there. Based on the 6/30/09 SEC filing, occupancy was down slightly. Total liabilities and equity for SPG were down approximately 17.5% from December 2008. Hmmm…with dividends the stock is up over 30% this year and has a current Price to Earnings ratio of over 40. Granted, they do seem to be a well run operation, but c’mon — that is a seriously rich valuation. After examining a few more of the holdings in the Vanguard Real Estate ETF it appears many folks have forgotten the common sense variable. Be wary of the recent run-up on the publicly traded REIT’s and keep your common sense hat close by. The U.S. banking system is a fractional reserve system, an understanding of which is vital for identification of the recent banking crisis origins. The earliest forms of banking consisted primarily of Money Warehouses where a depositor received a “receipt” stating the amount of “money”, typically gold, that had been deposited. These receipts could be used as a form of currency. The bank could not touch the deposits. The money was simply stored like any other goods such as wheat or lumber. Banks, like warehouses, would charge a fee for holding the depositor’s funds. In Fractional Reserve Banking, the bank owns the depositors’ funds. The deposit is a loan to the bank, which can then be loaned to another party, or invested, as long as the bank conforms to regulations. Rather than charging a warehousing fee, the bank earns its revenues through the difference between the fee charged to the borrower and the interest paid to the depositor or through investment returns. In this form of banking, a bank is essentially always inherently bankrupt. All depositors can demand immediate payment of their deposits. In fractional reserve banking, the bank cannot honor this demand, thus the term “bank runs” whereby a bank is immediately bankrupt when a large enough portion of its depositors withdraw their funds When a business chronically cannot honor its debts in a timely manner, it is considered insolvent in any other industry. Thus we come to the Central Bank and Reserve Requirements. The Central bank defines the Reserve Requirement, which is the minimum fraction of the deposits that must be held in reserves. If the reserve requirement is 20% and the bank has $100 in deposits, it must place $20 in reserves. The simplest explanation for the recent banking crisis is that the banks made loans and bought investments that significantly depreciated in value. In the example above, the $80 the bank was free to use, was invested in activities that left it worth say $25. Talk about putting a business in jeopardy! The bank has “loans” from depositors for $100 that can be called at a moment’s notice, and only $45 to meet those demands. The FDIC attempts to limit this risk by guaranteeing that deposits up to $100,000 are will be guaranteed by the FDIC. So how does this relate to inflation? Using our first example where depositors put $100 into the bank, the bank can then lend $80 to a business. There is now $180 in our simple economy. The original depositors can write checks against the $100 they deposited and the borrower can spend the $80 the bank loaned him. That means the supply of money increased by 80%. What happens when the supply of something go up? Prices go down. For money, this means purchasing power. What originally cost $1.00, could now cost $1.80. The supply of money then can be altered by either increasing or decreasing the Reserve Requirements, or by giving banks credit in their reserves. We are pleased to announce the opening of our new office location in Lafayette: 985 Moraga Road, Suite 205, Lafayette, CA 94549. All phone and fax numbers remain the same. Our San Diego area office is still at 7777 Fay Avenue, Suite 230, La Jolla, CA 92037.